Explain how Omni-Channel Supervisor provides a comprehensive view of your support team’s work. 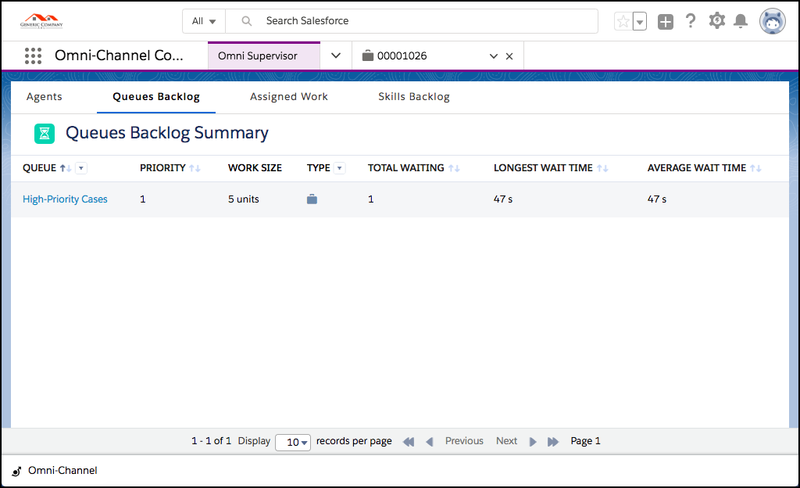 Use Omni-Channel Supervisor to monitor agents, queues, work, and backlog. Create a custom report type for Omni-Channel. Sita is pleased with how Omni-Channel has improved productivity for Ursa Major’s customer contact center. Omni-Channel always assigns cases to the right support agents, and customers are happy with customer service. The agents like having balanced workloads, and the support managers are relieved that Omni-Channel is automatically prioritizing and routing work. The support managers ask Maria if there’s a way that they can get a holistic view of how everything’s going at the contact center. In fact, there is! Omni-Channel Supervisor is the one-stop shop for supervisors and managers to check on the health of their call center. Supervisors can see how their agents, queues, skills, and work items are doing with useful at-a-glance information like wait times, average handle times, active handle times, and more. When they want more details, they can click on any agent, queue, or work item to see more without leaving Omni-Channel Supervisor. Omni-Channel Supervisor supports both queue-based routing and skills-based routing. If you’re using queue-based routing, you see the Agents, Queue Backlog, and Assigned Work tabs. 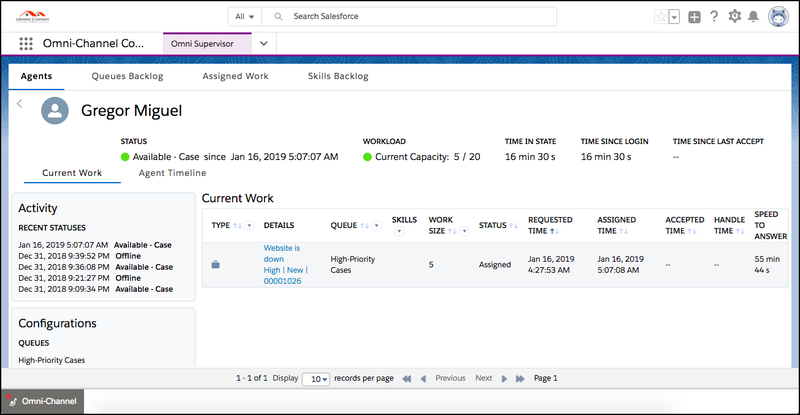 If you’re using skills-based routing, you see the Agents, Skills Backlog, and Assigned Work tabs. If you’re using both queue-based routing and skills-based routing, you see all the tabs. Wherever you are in Omni-Channel Supervisor, there’s no refreshing required—the data updates automatically. Watch handle times tick by the second, and average wait times change as agents accept and close their work. Maria can’t wait to show the support managers around Omni-Channel Supervisor. Here’s how Maria adds Omni-Channel Supervisor to her console. Next to Omni-Channel Console, click the down arrow then click Edit. Click the Navigation Items vertical tab. 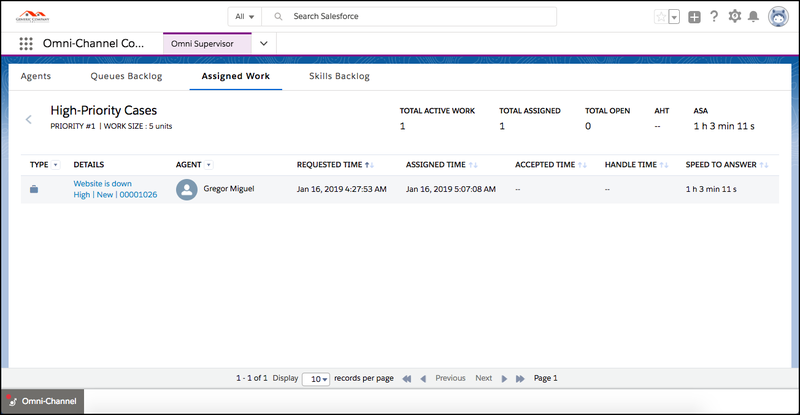 Search the Available Items for Omni Supervisor and add it to Selected Items. Maria takes her time exploring Omni-Channel Supervisor. Let’s follow along. Do you have a case open? Open work gives you more to look at. If you’ve closed your case, no problem. Create another case and route it to yourself using Omni-Channel, or you can just look through Omni-Channel Supervisor without any open work records and let your imagination fill in the rest. You’re on the Agents tab with the All Agents view open. This is where supervisors and managers can get an overview of who’s online, what channels and queues everyone is assigned to, and how close to capacity everyone is. But there’s no one here! Now you’re online as an agent, and you can see the time-based fields counting up by the second. That’s real-time data. As the supervisor, you can change an agent’s status on this view. You can also sort and filter by each field to quickly get information you need, such as how many agents are at capacity, or who’s able to take chats. You can see your recent statuses, from when you popped in and out of the console to test Omni-Channel. If you still have a case open, you can see it under Current Work. As an agent opens and closes their work, time-boxed work items appear here so you can see how long they’ve worked on each item and how their work overlaps. You can also see their status changes, so you can make sure they’re taking enough breaks during the day. If you go back to the Agent Summary view, there’s a tab to see the Agents by Queue view. This view shows you how your queues are staffed. But you’re the only agent online and you have only one queue, so let’s move on. Here supervisors can see all their Omni-Channel queues and get a quick look at how they’re doing. As work comes in, the longest and average wait times update to reflect the most accurate times. If you followed along in the previous unit, you have at least one item in the queue. Click your queue to see the queue detail view. Here you can see all the work assigned to the queue and a ton of relevant information. Again, you can sort and filter the fields to find exactly what you’re looking for. This is your Work Summary view. You can see vital information like the average handle time by queue. Click any queue to see the work detail view, where you can see all the work assigned to the queue, along with more details like which agent is assigned to the work, how long each item’s been open, and the active handle time (how long the work is open and in focus). Because it doesn’t need to be refreshed, you always have an accurate count. 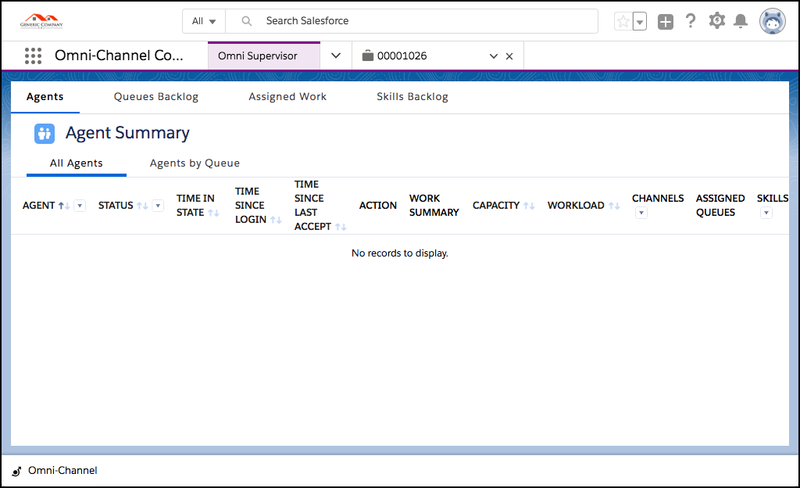 Even though your console has only one agent, queue, and work item, you can probably see how useful Omni Supervisor can be for agent supervisors and managers. But what good is all this data if you can’t take a look at how it changes over time? That’s where reports come in. Real-time data means things change fast. At Ursa Major, contact center supervisors have been keeping their eyes glued to the screen to make sure they don’t miss anything. Maria can save their eyes (and their sanity) by creating a custom report type that agents and supervisors can use to examine useful data like average wait times for queues and how much work their agents are handling. Here’s how. First, let’s create a report type for Omni-Channel. From Setup, type Report Types in the Quick Find box, and click Report Types. If you see the What is a Custom Report Type? page, click Continue. Select Agent Work as the Primary Object. Enter Omni-Channel Reports for the Report Type Label (the report type name auto-fills to Omni_Channel_Reports). Enter the description: Report using Omni-Channel data. Select Customer Support Reports for Store in Category. We aren’t creating any object relationships, so click Save. Great job! Next, let’s make an Omni-Channel report. From the App Launcher, search for Reports and select Reports. Click Customer Support Reports and select Omni-Channel Reports. Add columns to your report. If you want to see data from your time as an agent in the console, add Assign Date, Active Time, Handle Time, Speed To Answer, Decline Date, Decline Reason, and Last Modified By: Full Name. Click next to the report name to edit it and change it to: Omni-Channel Work (the Report Unique Name auto-fills to Omni_Channel_Work). Click Save, then Save, and Run. Now you can use the data from Omni-Channel to generate reports to check on the health of your contact center. The Ursa Major Solar support managers are thrilled to see all the great data from Omni-Channel and Omni-Channel Supervisor. It reassures them that agents are handling the work quickly and that the contact center is productive. They can’t wait to share the news with Sita and Maria.